With the COP24 climate summit in Poland just weeks away and only months until the European elections, the IPCC’s latest report underlines the urgency for action on climate change. Other reports concur, emphasising the need to transform the farming sector and with it the way we produce and consume food. Olivier De Schutter discusses Common Agricultural Policy (CAP) reform, what agroecology means for farmers, and how only an overhaul of the food system will make it sustainable. Green European Journal: How big is the role of the food industry in climate change today? Olivier De Schutter: The food system accounts for 32 per cent of greenhouse gas emissions globally today. Europe lies around this average, with agriculture accounting for 12 per cent of EU emissions, to which we must add processing, packaging, cold chain energy consumption, inputs for industrial agriculture, and more. This is considerable. Transitioning to agroecology, reducing consumption of meat and dairy products, as well as using less input-hungry production methods, can therefore play a decisive role. The opportunity is that although coordinated transformation is required in terms of production, processing, supply and demand, these changes are mutually supporting. Diets that are better for the climate are better for our health, particularly when it comes to reducing the prevalence of non-communicable diseases linked to obesity, for example. Working on the entire food chain benefits not only the climate, but other sustainable development objectives too. Apart from reducing food waste and meat consumption, what are the other avenues for change in the immediate future? There is a lot of talk about meat and waste because these are two areas in which households can change their consumption habits and behaviour to contribute towards this societal goal. In terms of production, a growing number of experts are now emphasising the urgency of the agroecological transition. The gains could be considerable, particularly the restoration of the soil’s natural fertility, which could become a significant carbon sink and reservoir of biodiversity. The conservation of hedgerows and shrubs also allows pollinators to thrive, thus checking their disappearance due to pesticides. There are numerous obstacles, of course. But the need for these transitions is clear and increasingly acknowledged. If statistics and behaviour are anything to go by, meat consumption doesn’t seem to be falling massively. 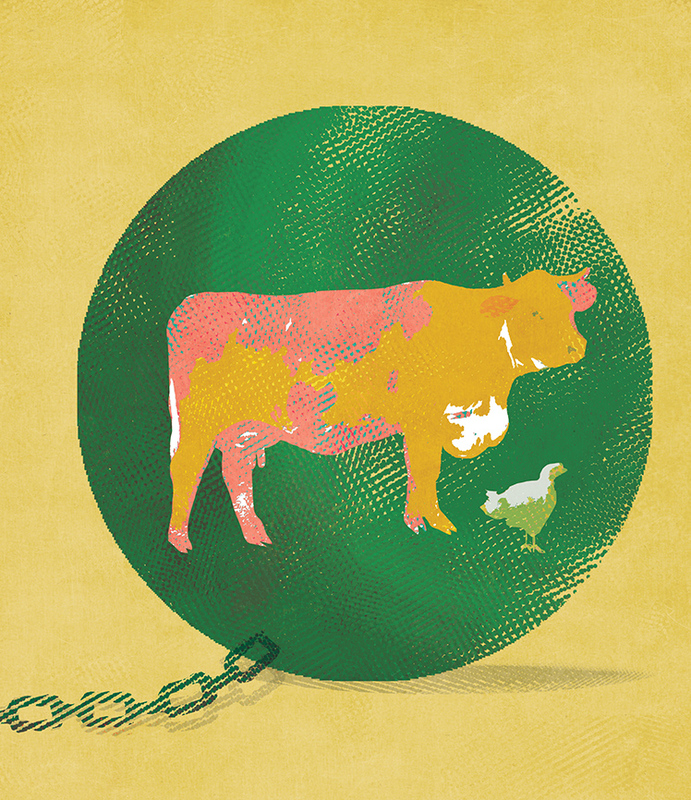 How can we reduce meat consumption? The growth in meat and dairy product consumption globally seems difficult to slow, particularly given the growth of the urban middle classes in emerging economies. In Europe, meat consumption has fallen slightly but remains three times higher than the level nutritionists recommend. In Belgium, for example, the average person consumes 50 kilos a year, whereas 20 kilos would be more than enough. The problem in this debate is that different sectors can’t speak to each other. We talk about meat in the singular, when we should be using the plural. There is in fact better quality meat that is the result of pasture raising where animals are fed mainly on grass and hay. Most of the meat produced in France, for example, is of this type. It should also be remembered that these pastures are in fact important carbon sinks. But then, on the other hand, there is meat produced industrially, where animals are mostly fed on forage that comes from soy and maize imported from Latin America and the United States. With this type of farming come serious problems of pollution and deforestation in the Global South, as well as the treatment of animals with antibiotics because they have to be protected from the infections caused by conditions of confinement that are completely unsustainable. But looking beyond the EU, this raises serious questions about lobbies and entire industries in developing countries that are oriented towards raising livestock. What action can be taken to change the business of raising livestock for export? The key is food democracy. Most European agricultural and food policy today is decided in secret through discussions between lobbies and decision makers. Faced with this opaque way of doing things, more and more parts of society – advocates of small-scale farming, environmental groups, NGOs working on North-South relations and development issues, charities that defend consumers and low-income households, public health specialists – who aren’t necessarily used to working together, are discovering that they have a shared interest in change and are calling for a genuine common food policy at a European level. The obsession with exports holds everything else hostage. There are extremely important social movements in Brazil, for example, one of the world’s largest soy exporters. One of these is the Landless Workers Movement, which advocates agroecology and wants to feed Brazil differently to through large soy monocultures destined mainly for export and the domestic production of biodiesel. These movements would receive a massive boost from a European policy that was reoriented towards the local production in Europe of vegetable protein to compensate for a reduction in imports from Brazil. Only the Brazilian government, and the agro-export lobby that wields so much power over it, take the position that Brazil would be the loser of such a policy. There is in fact a fierce debate in Brazil, and there is a strong opposition to the further development of soy monocultures and the emphasis placed on ethanol and biodiesel production to the detriment of the country’s food production diversity. Furthermore, through these massive imports of soy, the European Union is breaking its own rules. Article 208 of the Treaty on the Functioning of the European Union (on policy coherence for development) in principle requires trade policy to be consistent with development objectives. But we see here once again the chronic European problem of the sectorisation of policies and the lack of coherence between sectoral policies. How can we overhaul the global food trade system? The system needs overhauling because it is based on the belief that trade automatically brings more growth, and that this is desirable as a matter of principle, whereas what really matters is the content of growth (its qualitative dimension), or the nature of the development that trade encourages. The increase in trade flows should never be seen as an end in itself, yet it is this increase that the international organisations that govern international trade are obsessed with. The diplomats within the WTO or the European Commission’s DG Trade are stakeholders who have invested enormously in these negotiations and are under pressure from export industry lobbies. They have forgotten that trade is simply a means to something else. Trade can play an important role as a driver of positive change in both importer and exporter countries. But to do so, it must reward the countries that act most responsibly rather than encouraging environmental, social or fiscal dumping. Today, the lowering of trade barriers favours these various forms of dumping. The lowering of tariffs or regulatory convergence forces competition between economies who, under the pretext of leveraging their competitive advantage, oblige the producers and workers of different countries to compete with one another. And at European level, it’s the Commission that has the competences and powers on questions of trade. Yes, and it should also be said that the environmental or sustainable development chapters in the European Union’s free-trade agreements are very inadequate. They are essentially symbolic. The negotiators don’t want to risk annoying our trading partners and this is based on the idea that trade can lead to growth when really we should be asking ourselves on what conditions is growth desirable. To give an example, one of the European Commission’s main arguments in favour of the free-trade agreement with Japan, JEFTA, is to increase pork and dairy exports to Japan. Yet, production of both of these is responsible for extraordinarily high levels of greenhouse gas emissions. This free-trade agreement therefore completely contradicts our climate commitments as part of the Paris Agreement. This illustrates the contradictory position in which the EU finds itself. It’s food sovereignty that should be the goal of our initiatives in this area. Trade should have a role, but a subsidiary one. What regions are able to produce to satisfy their needs, they should produce, and trade should compensate for what regions are unable to produce for themselves. Today, we’re in an absurd position where most infrastructure investment and subsidy policies are aimed at supporting export competitiveness, while a relatively low proportion of products – 15 per cent on average, varying from 40 per cent for soy to 7 per cent for rice – actually cross an international border. The obsession with exports holds everything else hostage. Negotiations on the future of Europe’s Common Agricultural Policy are underway. What can be done to prevent a repeat of past mistakes? What are the limits and opportunities in the current context? Stakeholders in the agricultural industry have been very dependent on the path outlined by the CAP in past decades. With all policies that involve the payment of subsidies, change can only be made on the margins, because they create expectations from economic actors, investments have been made and loans have been taken out, etc. It’s very difficult to change course. Moreover, a common agricultural policy, even reformed, is not enough. We need a common food policy that would oblige agricultural policy decisions to consider impacts on health, the environment, rural development and aid for developing countries. Adopting a common food policy does not mean we need to compensate for the negative effects of the CAP; it means we need to reinvent it. Not by transferring new competences to the European Union, but by adopting an integrated strategy that overcomes the sectorialisation of the current policies that influence our food. Today, there is a split in the European Commission with the DG Health and Food Safety, DG International Cooperation and Development and DG Environment all worried about the impacts and consequences of the CAP, while DG Agriculture considers it as its exclusive domain. It’s really a problem of governance and fundamental design of public policy. Adopting a common food policy does not mean we need to compensate for the negative effects of the CAP; it means we need to reinvent it. The European Commission sees CAP reform, under the pretext of simplification, as leading to a relative renationalisation of the CAP. Governments will have to develop strategic agricultural plans that will have to be approved by the Commission in fulfilment of certain commonly agreed objectives. I fear, as do many, that member states will seize upon this greater autonomy as a pretext for dumping, particularly when it comes to the environment. We must therefore insist on the strict verification of environmental conditions when it comes to using European taxpayers’ money. However, once EU member states are given greater freedom to develop these strategic plans, I see two opportunities. First, require national plans to be drawn up through participatory processes. Food democracy is not just a slogan. This could take the form of food policy councils, consultations, etc. France has shown the way with its National Food Conference. And these strategic action plans must be negotiated, not just with the agricultural world and the biggest farming unions, but with all stakeholders interested in the future of food and agriculture. Second, even though the Commission does not have competences in certain areas, it could subject approval of national strategic plans to the meeting of certain conditions. For example, why not allow public schools to insist upon social and environmental clauses – and the sourcing from local producers – when awarding procurement contracts (by amending, if necessary, the 2014 European directive on public procurement) both to help the local economy and improve school meals? We could make the inclusion of this type of innovation a condition for the approval of national strategic plans. How much power do small farmers have? I believe that we, and our leaders, are mistaken if we think that just because only a small part of the population is employed in agriculture (for example, less than 2 per cent in Belgium), there isn’t a movement behind the issues of agriculture and small farmers. The issue of small farmers concerns everyone and affects our food, soil health, rural depopulation, and so on. Today, very belatedly, we are realising that small farming is a type of agriculture that provides a multitude of benefits to the wider community. You’ve talked a lot about agroecology: what is it exactly? Agroecology is not organic farming, which has a set of standards and a European regulation that define it and subject labelling to very precise conditions. Agroecology is rather about a different relationship with nature that is much more respectful of the complementarities that ecosystems offer between humans, plants, and animals. The farmer reproduces these complementarities at the level of the land cultivated. Unlike the industrial agriculture paradigm, which is based on the domestication of nature and the planting of monoculture crops in rows that are easy to process with machines, agroecology sees nature as an ally rather than an adversary. Agroecology involves replacing pesticides with biological control methods, such aligning different types of plants to protect against weeds; replacing chemical nitrogen fertilisers with green fertilisers or with the planting of legumes; or planting hedgerows, trees, and shrubs that prevent erosion by shielding from the wind and ensuring that rain water does not run off too quickly, thus allowing the soil to capture moisture. Agroecology also guarantees greater agrobiodiversity and greater resilience to climate shocks, because a large number of different plants are cultivated in a small area. Resilience is also economic because there is not complete dependence on a monoculture. Unlike the industrial agriculture paradigm, agroecology sees nature as an ally rather than an adversary. But agroecology is not just a series of agronomic techniques; it also involves reshaping the entire food chain and the relationships between stakeholders. One of the major challenges for agroecology today is that, even though it produces a lot from small areas of land, much more than monocultures do, it produces small amounts of all sorts of things. Agroindustry buyers – Unilever, Danone, Cargill, Louis-Dreyfus – are not particularly interested in these small volumes, which are highly diverse and do not meet the standardised forms that consumers are used to, or have been conditioned to, buying. The fight for agroecology today is not just a fight for agronomic techniques that are more environmentally friendly, it’s also a fight for different production systems and ways of remunerating producers. Concretely speaking, how would, say, an Irish pork producer or a Spanish olive grower transition to agroecology? This is a really important question because the transition to agroecology cannot be done overnight, and there must be a realistic path for farmers to follow. First, the switch from an input economy to a knowledge economy is key. Agroecology needs few inputs but it does require farmers to be trained in agroecology techniques. Yet, at the moment, much of the training given to farmers comes from input suppliers. Second, it is important to acknowledge that for three or four years the transition will result in a fall in income. It requires creating a system built on new foundations, developing crops and learning how to create enough biomass to do without inputs. This transition must be supported financially, for example through a subsidy of at least 80 per cent of farmers’ previous income for four years, in return for a credible transition plan. Lastly, markets and food systems must be developed. Major agri-business buyers are not willing to buy small volumes and the transaction costs are enormous when they buy from a large number of small producers. I think that an agroecology policy with these three components – dissemination of knowledge, support for economic development and food systems reform – will enable this transition to happen. At the moment, many farmers feel trapped because they don’t have the impression that there is a path to transition for them. Yet they are the first victims of this dominant and unsustainable system.